the idea of the US government bombing, say, Milwaukee to kill a hundred partisans is a much better comparison. Alderaan wasn't at war with the Empire, it was a MEMBER of the Empire. It seemed from Tarkin's statement that "rebel operations on Alderaan" had little to do with the reasons for targeting it. "Not remote, so makes a better demonstration than targeting an actual Rebel Base" is an almost word-for-word paraphrase of the reason he gives. The problem with comparing the Empire to any historical country is that other countries exist: the Empire dwarfed any other state that existed to the point of negligibility. It's unopposed from without during its time. The nearest we can get is if America reformed into a military dictatorship, premptively turned its nuclear arsenal on Russia in 1945 and became the ultimate power in the world by threat of nuclear annihilation. The destruction of Alderaan is a political move, not a military one, an act of terrorism rather than an act of military strategy. The point is to demonstrate that the Empire has the ability to destroy any planet that dissents or habours dissent and the will to use it. Were it not for the exploitation of its fatal weakness the Death Star would have effectively been total victory for the Empire. A completed Death Star II would have been the same, hence the Rebels risking everything to destroy it. I think it's fair to assert that a Base Delta Zero is a significant undertaking requiring a colossal military presence simply from how rare it is. That, or/and it can be countered by a respectable planetary shield: Thrawn's fleet is unable to attack a shielded planet in the Thrawn Trilogy and the planetary shields are what prevents a proper assault on Coruscant in both Stackpole and Zahn's EU works. 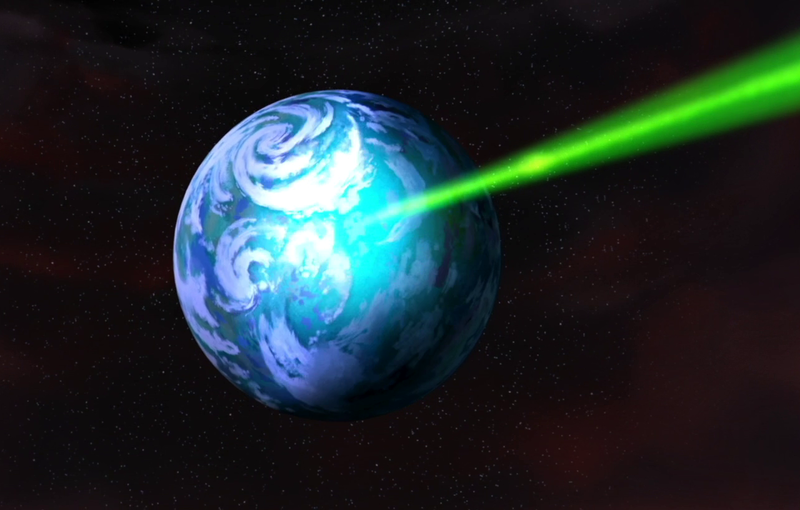 It's also possible that a BD0 can only realistically cripple a planet rather than wipe out its population when you take into account military resources and timescales: the destruction of Taris is a BD0 which destroys everything over a few stories tall but is hardly an extinction event. Base Delta Zeroes are highly destructive but take a long time and are impractical as an extinction event: the bombardment can be survived. They require an extended siege which limits their applicability as a shock and awe method. Base Delta Zeroes do not work well against planetary shields: a developed world has the defences to resist them and an undeveloped world isn't sufficiently populated for a BD0 to be effective. The only situation where a BD0 can be carried out on a developed world is one where the Empire is already in control. This may require firing on one's own troops (as with the destruction of Taris) which does not inspire loyalty and is probably less effective than an occupation for most purposes. An extinction level BD0 in a realistic timescale would require a commitment of military resources the Empire couldn't afford without leaving other parts of the galaxy undefended. The speed of the Death Star is as much of an advantage as its power. Okay. But the movies make no mention of planetary shields. And why not have focused shields that can block the death star's attack? Why not use nerve gas and not "turn the surface molten" to take over? If the planet is intact, so is much of its infrastructure. Kill enough people and they will submit, no? Mining the debris field seems inefficient to me, as some material would be lost, and much would be scattered. And beyond regular resources, the space on the planets would come in handy, right? And would there be empire loyalists on some planets but not others? Are all planets homogeneous when it comes to empire support? I don't know. I don't really mean this a serious argument to your points (and your points are good ones); it's just that these debates rely on fictional "worlds" (or galaxies) that have some silly rules (I still dig the worlds). In this case, I'm using the information from the movies alone and you're going into the novels. There's nothing wrong with that, but at a certain point we both end up dealing with the creators' lamp shading (or maybe it's hand waving) to do it. Okay. But the movies make no mention of planetary shields. RoTJ had a shield projection from the Forest Moon, big enough to encompass the Death Star. TESB had a shield big enough to cover the base and powerful enough "to deflect any bombardment". Combine the two, and you've got a certain amount of justification for the notion of a network of shields covering a whole planet. The destruction of Alderaan is a political move, not a military one, an act of terrorism rather than an act of military strategy. As ethical theories and legal tribunals have found time and time again, "just following orders" is not a moral or legal justification that alleviates one of their culpability in a greater system. One always has the option to not follow orders. Biggs, Finn, and many others defected from the Empire/FO. Others sabotaged from the inside. Anyone could refuse to participate, even if meant their death. It's hard to imagine the operators of the super-laser could go back to their bunks after destroying Alderaan thinking "jeez..that was pretty bad...no that was terrible in fact..all those peoples...oh well, no blood on my hands, I was just following orders! I'm a good guy! Nothing I could have done differently! I had no choice! "PS: I know the vast majority of fans who say that the Empire are the good guys are obviously trolling. But I've met some who genuinely feel that way. and I think it's a product of modern nihilism and gritty morally-gray morally-ambiguous outlooks (which in reality is sometimes the case). But one of the timeless features of Star Wars has always been that it has adhered to a very clear "Good vs Evil" framework at its core. Unless you are on the victorious side, then just following orders is perfectly fine. We generally only punish the losers in conflict, do you think if Germany had won WW2 the orchestrators of the fire bombing of dresdin would not have been tried as war criminals? And I could name many other things. History is written by the victors. (Not saying the nazi regime was not evil) just saying if your side wins then just following orders seems to be just fine. Uneven punishment after warfare leads to things like WW2 if the world (specifically France) had not utterly crushed out the future of the German economy after WW1 we may not have had a second world war. Lastly evil is very subjective, how many people did the rebels kill before alderon? How many terror style attacks were done in the name of the rebellion? In a conflict there is rarelly someone on the side of good, just groups with there own agendas doing what they have justified to peruse those agendas in the next of good. Well, "just perfectly fine if you were the victor" is ambiguous. It might be the case that people committing such atrocities under a victor are not legally punished or held accountable. But that doesn't mean they haven't acted immorally. Morality and legality are not always the same. Also, to say that 'evil is subjective' is to fully embrace Moral Relativism, which very few ethicists, theologians, or philosophers have done throughout human history. The vast majority of Ethical Theory is an attempt to identify the nature of an objective morality (independent of an individual's personal position or desires). Otherwise you're not really talking about morality. Moral Relativism is the spirit of the day. I have a Christian friend that speaks at college campuses and he says it's not uncommon for him to run into kids who can't even commit to something as terrible as r a p e being wrong. Because that's relative to the society you're talking about its wrong in ours but may not be in another society. In the past human sacrifice was a part of some societies like the Aztec empire, we wouldn't allow it but for them it was normal. Ancient Rome had animal sacrifice, most had slavery at some point etc. Morality is directly related to the society it exists in, it's not inconceivable a society that condones such assault could exist and in that culture it would be moral. Our societies laws have nothing to do with religion after all no one's stoned to death for working Sunday's and we don't allow revenge killing like the bible says you must commit if someone kills a family member (accidental manslaughter included). If there is no God, and there is no final authority, then nothing is black-and-white and we are all animals and who really is to say what is right or wrong anyways? Wow, this an exceptionally sophomoric take on ethics, Rick. Plato, Aristotle, Hume, Kant, Bentham, and Mill are just some of the many philosophers who have offered robust ethical theories about what objectively determines if something is RIGHT or WRONG independent of any appeal to a divine authority. Also, there are and have existed millions of atheists and humanists and agnostics who have lived good lives and held firmly to moral principles without the belief of a god who is handing out a "final authority" on morality. Does God command an action because it is good, or is an action good because God commands it? If the former, then there is something about that action that makes it good independent of God's command (and that's why God command its), and we can and should appeal to those moral reasons when justifying actions and deciding how to act (we shouldn't simply stop at "because God said so!" as a moral justification, because there are other more fundamental reasons that determine the morality of it). Alternatively, if the latter, then that means there are no reasons for why things are good and bad and that God is purely arbitrarily endorsing and condoning actions as good/bad. But this doesn't seem right, because it would make morality a result of arbitrary coin tosses without any reason whatsoever, and we can't imagine a world in which a God would have commanded wanton **** as the right thing to do (because our intuition there is something about such an action that makes it wrong). If God was perfectly random in condemnation and endorsement of behaviors, then it would raise questions as to whether the God was a morally-perfect (omnibenevolent) being worthy of worship and obedience. So, it's a pretty clear case as to why Divine Command Theory is neither necessary nor sufficient in establishing the foundations of morality. Either God's endorsement/condemnation of actions is meaninglessly arbitrary and without reason OR God's endorsement/condemnation of actions is just a reflection of other moral truths and reasons which we can and should appeal to directly. You can do better than that! How about "Can God make a rock so big He can't pick it up?" I believe that moral law comes from God's mind, so the answer is both. God created man in his own image (which is why humans are not animalistic); and God wanted to love man and for man to love Him back. True love requires a decision, hence the tree of the knowledge of good and evil. Man rejected God's command, ate of the tree, gained the knowledge, and at that point God said that man having that knowledge became as God (in that he had the knowledge of good and evil). Man, now having the knowledge of evil goes on a warpath of death and destruction. Some blame God for that, and if He is at fault He sent Jesus Christ to fix it. Jesus dies to atone for the sins of humanity and redeems all who have enough humility to accept His gift of salvation. I have no doubt you can run circles around me in the areas of philosophy and theories. I will be surprised if I'm not mocked for this. But I have seen the proof firsthand of what living by biblical principles does for a family. Generationally on both sides of my family there has been nothing but destruction, and it was finding Jesus Christ that saved my parent's marriage and lives. Salvation through Jesus Christ alone and submission to biblical principles have kept my wife and I on track, and I have seen it over and over again with others. Has nothing to do with us and everything to do with Him, and there are millions more worldwide that would tell you the same thing. Okay. But the movies make no mention of planetary shields. And why not have focused shields that can block the death star's attack? Presumably because they can't. The Death Star is partly Force-based with similarities to ancient Sith superweapons: it's in many ways a giant uncontrolled lightsaber. That also may be part of the reason why Palpatine is drawn to it as a superweapon as opposed to other methods. Why not use nerve gas and not "turn the surface molten" to take over? I believe the Empire does do that to the Geonosians but they keep it under wraps. I'd imagine there are logistics issues with producing enough of it and deploying it. As a chemical agent it can also be dealt with fairly easily and the galaxy is full of environmentally hostile yet inhabited planets: people could likely survive it if they were prepared. It has the same problems as the Base Delta Zero in that it's harder for Palpatine to directly control than the Death Star is. It's also probably slower than the Death Star is. The Death Star is in many ways a psychological weapon: a nerve gas approach doesn't create the same Ultimate Sword and Ultimate Shield effect that the Death Star does. Mining the debris field seems inefficient to me, as some material would be lost, and much would be scattered. And beyond regular resources, the space on the planets would come in handy, right? And would there be empire loyalists on some planets but not others? Are all planets homogeneous when it comes to empire support? I don't know. The Death Star isn't a sensible investment from a purely logical perspective: it's a terror weapon. Strategically it's incredibly wasteful but its purpose is psychological far more than it is destructive. As for loyalty amongst the populace, under the threat of another moon appearing in the sky and planetary obliteration minutes later priorities change. To give a real world exmaple, people in general tend to overlook substance abuse from other people. If the police response to substance abuse was to massacre everyone in a mile radius regardless of involvement I'd wager people would be much less likely to overlook it. I'd have to disagree with you there. Can't think of a single thing that's consistent across animal species that doesn't extend to us. Well, except maybe language. Wouldn't be surprised if the ability to learn (relative to other species) complex concepts from each other is what propelled us to our current dominance. The Resistance said Starkiller base had a shield, hence the Falcon's lightspeed approach to the planet. The Empire is a form of government, certain leaders and members are morally evil. The overall Empire... I doubt it. Again (warning point incoming) If the US was led by an evil man, would the US be evil for their actions based on foreign policy? I have a better question. If the US would be led by a good man, a man who believed in the good of men and mankind, would the country still be evil based missguided on actions and foreign policy? ..
To keep real world politics out of it: Look at the republic, which was unable to maintain peace within its borders, nor able to enforce its rules. corruption a more widespread problem than even in the empire. Slave trade, blackmail, the banking clan and trade federation squeezing out worlds and whole sectors out of their lifeblood and gaining even private corporate government in the corporate sector. It kind of shocks me that anybody can defend the morality of a faction that was not only capable of, but did destroy an entire planet that was unarmed and historically had never attacked anybody. You can't make an omelette without breaking a few eggs. In the grand scheme of things, what's a planet (or two) if it means Order! Peace! Prosperity! I wrote something, then deleted it because it was not a positive contribution to the topic as stated by the OP. Maybe if the empire had the balls of the us leadership and just kept exploding civilian targets the rebels may have capitulated? Welcome to the dark side. The cookies are in the kitchen, we recommend the ones with extra chocolate. Yup I got nothing, even my RPing a loyal Stormtrooper/pilot who is just trying to do what he thinks is right isn't going this far. Well... does it help to make you feel better knowing that the fire bombing of Tokyo on the night of 9 March 1945 caused more casualties than Hiroshima & Nagasaki (and Dresden)? And that most of those killed suffered protracted, horrible deaths? Kinda makes those "little ol' A-bombs" seem pretty nice, doesn't it? DEath in an instant by ONE bomb or roasting to death in a firestorm caused by a few THOUSAND...? ... I don't think the residents of Tokyo or Dresden would have considered themselves *lucky* to have not lived in Nagasaki or Hiroshima. How did I sucked into this? I think you are underestimating the suffering of the many who weren't nuked into ash. There wasn't some magical line between Dead! and Phew, that was close!. Radiation is a thing. Obviously the Americans in the 40's and The Empire in that galaxy far away and long ago don't have the benefit of our amazing 2016 wisdom. Clearly in this day and age Tarkin would not have blown Aldaran up. He would have built a wall around it. Sadly, a typically American response to taxes. "If I don't decide how the dollars are spent personally, no one can have them." Let's forget that taxes repair roads, provide Medicare, fund schools, pay the police and fire departments, etc. So what we get is privatization of everything, leading to toll roads, 401Ks for retirement, mandatory health insurance (rather than actual health care), and $900 Epi-pens. This only replaces "government over-reach" with corporate greed, but for some reason, this is easier to stomach for the average American. So far I've seen two arguments: one that the Empire is evil either due to being authoritarian or because of the methodology by which it maintains power, and the other that the Empire itself is simply an authoritarian power structure without inherent morality and its acts are a reflection of the immorality of those who run it. Essentially it's a consensus that the Empire are the bad guys and it's splitting hairs on whether it's fundamentally so or only practically so. I've yet to see the otherwise prevalent argument that the Empire is good. And doesn't the Death Star seem like a stupid idea in many ways? You're in charge of a galactic empire, and you decide to keep folks in control with a planet destroying weapon? Planets have resources--why would you waste them by blowing them up? If they wanted to go all genocidal why not blockade the planet and nerve gas the population and then repopulate with imperial loyalists? Sure, a death star would be good for destroying enemy fleets or going to other places and blowing up OTHER empire's planets. Blowing up the planets in the system was just wasteful. Even worse, destroying stars to blow up planets seems like it would totally **** up galactic systems. It's almost like parts of this fictional universe are really dumb. The empire had the firepower to initiate extinction level events on planetary scale before. What they lacked was the firepower to do it to planets with shields. Is it tine to point out the similarities between the Empire testing the Death Star on Alderaan to Anerica dropping the atomic bomb on Japan? Agreed. The A-bomb, in the long run, actually saved more lives then it took. Japan would've fought tooth and nail if the U.S. had gone forward with it's invasion plans, and left many more lives on both sides dead. Perhaps if the empire hit another civilian target and the rebellion collapsed it would have saved allot more lives as well? Nah. eDust. In this day end age of drones. The empire would have used edust on alderaan and killed all rebel supporters without mistake, every last of them .Sheev would have loved that stuff and George would have loved the comparison to drone strikes. Wasn't there a theory that Palpatine militarised the Republic and made it into an Empire in order to combat the threat of the invading Yuuzhan Vong? There's also a theory that Ja Jar is Snoke. Rax guarded something on Jakku. He prepares to get something from Jakku at the end of the second Aftermath book. I believe that this is Snoke, a being of great power that predates both Jedi and Sith, banished (probably for dark-sidey stuff) in some kind of crude stasis (therefor the screwed up face like that of a mummie), but known through Sith lore. Sheev rediscovered his tomb and recognized him as the only being powerfull enough to take over his reign, which made him both important as successor and dangerous as rival, which is why he was for the time left on Jakku. He then left instructions on what to do in the case of his death with Gallius Rax who now is ready to rebuild the empire as first order with Snoke at its head. The new republic believes Jakku to be a victory, when in reality Rax's fleet only held out as long as they needed to recover Snoke. Hm. I can see this, but I think it's important that Rey was left on Jakuu. This theory doesn't really address that, and so feels incomplete. We never really got to see how the average person lived their daily lives in the Republic and Empire so it's hard to judge which was worse from that perspective (obviously certain specific groups fared far worse in the Empire). But I think it's fair to say that any negatives in the Republic were more simply from incompetence than evil. The Bible actually has something pretty insightful to say on this: "Give to Caesar what is Caesar's." I may not be religious but it sums up the nature of currency quite accurately. The material coins and banknotes are made from isn't yours: it belongs to the central bank. That's why you can't destroy banknotes: they're not yours to destroy. What's actually yours is what the banknote represents: a statement that the government owes you its face value. Banknotes were once promisory notes for silver and gold: the name of the British currency, the Pound, comes from the measure of weight. You could go to the central bank and exchange it for gold whenever you wanted to. People didn't because notes and coins were more convenient. We've since moved on to fiat money: banknotes can no longer be exchanged for gold, just for the equivalent value of money. A dollar bill is a promisory note that entitles you to claim a dollar from the Federal Reserve, but as the dollar is an abstract concept you can only exchange it for another dollar bill. Say you have 200 dollars in your bank account. The bank isn't keeping them in a vault, it's off investing them in things. Your bank balance is how much the bank owes you. Thing is, the bank doesn't have any dollars either. It just has promisory notes that entitle it to claim that many dollars from the Federal Reserve. How many dollars does the Federal Reserve have? As weird as it sounds, money isn't real. It's as tangible as brownie points or owed favours. It has tradeable value without existing. A currency is completely at the mercy of the treasury that controls it. They can issue as much of it as they want: countries can and do print money. After all, nothing costs nothing to make. The government could wipe out all your savings overnight by issuing billions of new dollars and making the dollar worthless. It's called hyperinflation. The reason governments don't do this is because their economy relies on the perception of value of their currency: if they screw with it too much it'll be seen as unreliable and people will stop using it: a currency has to be trusted to work. When the government taxes you it takes some of your nothing away so you have less nothing, which is to say instead of nothing you have nothing. This allows it to give that nothing to other people to do public work for the government. It could instead create more nothing but that'd result in there being more nothing in circulation: the more nothing people have to trade the more nothing other people can charge for real things like goods and services. As the total worth of all dollar bills is nothing, the more dollar bills you have the more that nothing is divided amongst them. They've just reduced the amount of nothing they owe you.